After ruling the high-end, mid-range smartphone market, HTC wants to rule the budget phone market so launched, Oct-core budget smartphone, the all new HTC Desire 526G+ Dual-SIM with 4.7”-inch qHD display, Android kitkat, 8-MP Camera priced at Rs. 10,400 for 16GB and Rs 11,400 for 16GB in Black and White colour option. It will counter Xiaomi, Micromax and Samsung in budget phone market in India. The all new HTC Desire 526G+ Dual-SIM supports Dual-SIM(GSM+GSM), dual Micro-SIMs, Wi-Fi, FM radio, Bluetooth, GPRS/ EDGE, GPS/ A-GPS, 3G and 4G LTE comes with a bigger 4.7-inch LCD display with qHD (540×960 pixels) resolution with a pixel density of 234ppi delivers stunning color consistency from almost any angle and perfect for watching movies, playing games and reading e-books. HTC Desire 526G+ Dual-SIM run on Android 4.4 KitKat with HTC Sense UI and HTC BlinkFeed(upgradable to Android 5.0 Lollipop) powered by 1.7GHz octa-core MediaTek MT6592 processor while 1GB of RAM, 8GB/16GB Internal memory expandable up to 32GB via MicroSD card offers enough space to store your date. HTC Desire 526G+ Dual-SIM sporting a 8-MP Primary camera with LED flash, f/2.2 lens and with BSI sensor; HTC Eye perfect for catching your favorite moments and an 2-MP front-facing camera with BSI sensor; HTC Eye offers you the best video calling and Selifes experience. It also packed with a 2000mAh battery promising up to 19 hours of talk time and up to 525 hours of standby time measures 139.8×69.65×9.8 mm and weight 154 grams including Dual Front-Facing Speakers. 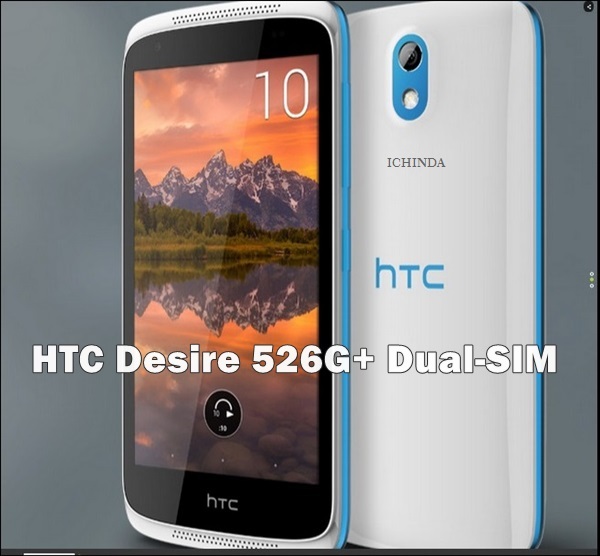 At last f to say few honest word, the all new HTC Desire 526G+ Dual-SIM is coming please the budget phone lovers in India. What you think? Please be open to give your view.